Why consider automated imaging for particle characterization? Many customers are not as familiar with automated imaging as a particle characterization technique. Here are three good reasons why you might want to consider automated imaging in addition to your more established techniques such as laser diffraction or microscopy. Automated imaging can provide data on particle size, shape, transparency and chemical identity in one measurement. In contrast to ensemble-based techniques such as laser diffraction, each individual particle in the sample is measured one-by-one, providing high resolution detailed information. This is often used to complement data from other particle sizing techniques. Automated imaging instruments typically measure tens to hundreds of thousands of particles in the same amount of time needed to measure a very small number by manual microscopy. This makes the measurement much more statistically robust. In addition, all the particle images are automatically and objectively captured, measured, analysed and classified for inclusion/exclusion, vastly reducing any operator subjectivity. 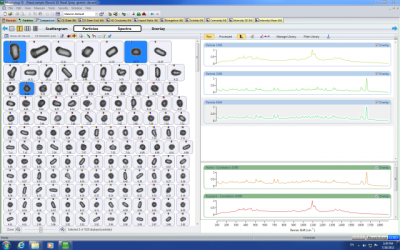 Individual images of every particle are stored for each measurement and are easily displayed together with the size and shape data for the sample. This provides a powerful visual verification of results, such as confirming the presence of agglomerates in the sample dispersion, or the presence of unwanted particles. If you’d like to find out more you can download a copy of the Automated Imaging Brochure by clicking on this link.